Home/Why a Quantum Harvest unit? 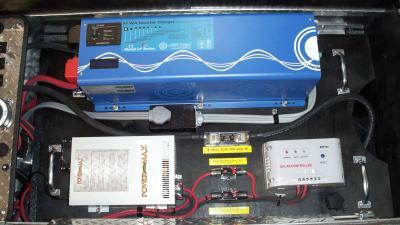 Link to our Comparisons of different solar generators page. Link to our Galleries page, featuring photos of some of our machines. The market is full of solar "generators", which in itself is somewhat of a misnomer; the only true "solar generator" is a star, or more correctly, the nuclear fusion going on in it's core. 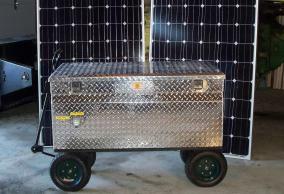 Still, since solar generator is a term that has gained widespread use, so be it. Both of these machines are advertised as 5000 watt units. Note that the above units are enclosed in a plastic container; also note that batteries are HEAVY! A 100 a/h battery weighs about 70-80 lbs. 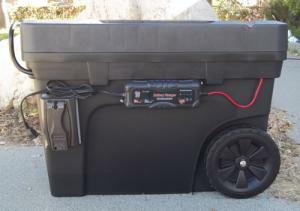 The left unit has wheels, but holds 2 batteries, at about 150 lbs total weight. A few trips around the ol' homestead, and those little wheels will be left by the wayside! Note the much larger size all-metal container, and the 8 big batteries. Also note the large marine-grade inverter. (The blue thing) It is rated from the factory as a true sine-wave, 6000 watt continuous output, with the capacity to put out an 18,000 watt surge for 20 seconds! This is a big inverter, weighing in at 90 lbs. Does the Quantum Harvest Model 5000 cost more? Yes, it does, but you get what you pay for. Which of the above machines looks like it can handle more? The QH Model 5000 also puts out 220 volts for submersible pumps up to 2 hp. Why the huge discrepancy in size between these three 5000 watt units? Well, first of all the 2 plastic units feature a 5000 watt surge-rated inverter. Continuous output is around 2000 to 2500 watts. But, even that is somewhat deceptive. The single 100 a/h battery in the smaller unit will power the inverter at a 2500 watt load for around 20 minutes at best; the reality is even more grim. 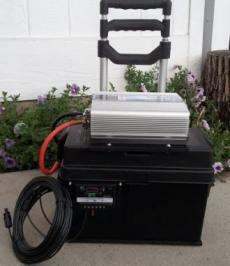 To sustain 2500 watts, the inverter must pull over 200 amps from that battery. Try that stunt for more than 30 seconds or so, and you will have a ruined battery. 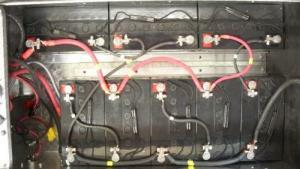 See this article for more information on battery internal resistance issues. The larger unit on the left has 2, 100 amp/hr batteries, so is somewhat better off, with a maximum theoretical run-time of maybe 45 minutes, but pulling 100 amps from each battery would flatten it in about a minute in reality. The inverter in the top two machines is a commonly available consumer-rated unit, retailing for around $200 +/-. It is also what is called a Modified sine-wave, referred to as a square-wave in the industry. 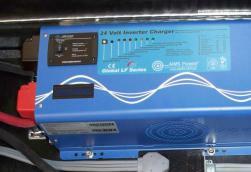 A true sine-wave inverter is usually about twice the cost for the same capacity.